A few years ago I moved out of my downtown studio (RIP) and decided to work from home again. It was a tough decision at the time but it was worth it financially and leaving behind the commute, parking and other things made it worth while. Working from home again meant making some adjustments to how I work and setting up the studio efficiently for optimum productivity and overall wellness. I turned our small apartment dining room back in to an office - some paint and creativity goes a long way. I had a larger space before and fitting all my studio furniture, supplies and equipment was a challenge. I pitched a lot and got more streamlined (I think I can still do this more - it’s ongoing) and rearranged the space many ways over time to find the right layout. I need three stations: a drawing/painting station, a computer station and a standing station. As seen above I have a laptop and an iMac. I had the iMac first then got a laptop and Wacom Cintiq for portability purposes. I find it is nice to be able to switch it up and work from the antique drawing table and then over to the standing desk. I get restless in one space too long (computer work chains you to your desk). Having different zones helps me stay organized with certain tasks and allows me to switch up the energy from standing to sitting to be in a new work position (so I don’t get antsy or uncomfortable, thus unproductive). Finding a place for supplies, books and papers was tough. I had to get creative with shelving and small storage solutions. I find that as it gets messy when I am working I need to constantly stay on top of it and clean and clear out as much as I can as I am working or in between projects. The small space can get really cluttered. This Maximalist loves to be surrounded by things I love but it can get out of hand easily when there’s not a lot of room to spread out and put things. 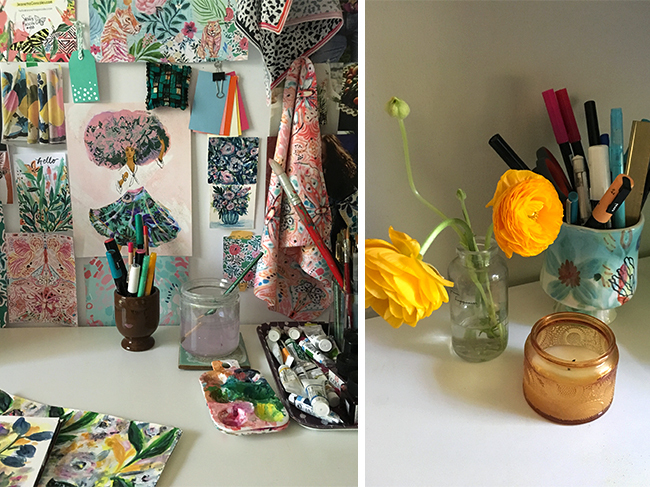 Speaking of being surrounded by things I love, candles, flowers and collectibles are a must in the studio. Their beauty makes me happy and brightens things up in here. I love fancy candles and saving fun things that people give me provide design inspiration. A large foam core board makes a great pinboard and I am always changing it up based on what I am working on or what I want to look at. I have had my share of erognomic issues over many years of being a graphic designer. I have had tendonitis in my wrist, pinched nerves in my shoulder and hip and back issues. I make it a priority to find the right set up wherever I am working. Because I sit a lot I tend to have hip issues and tight calves. I have a chiropractor on speed dial and am always getting adjusted in some way. Because I have this job that causes repetitive stress issues, I make sure I have the right work chair (I have an Aeron) and a standing desk option (Ikea desk with adjustable legs). The height of my computer is important too. The drawing table is at a good height for me. I do have to look down but it isn’t a strain on my neck. The white table where I do my painting can be swiveled perpendicular to the drawing table so I can see the computer screens and have a different vantage point. I sit in the “cute” mid century chair when I am working on something that isn’t as time consuming so I don’t sit in it too long. The antique drawing table can raise to standing height. I first got this in the old studio and used it as the standing desk before. After moving home I realized that I needed more space for the Cintiq so I raised the other white desk. It is working out great and as I go back and forth I can bring over the Cintiq to the standing desk to change it up or even draw on the antique desk in front of the laptop. Standing gives me more energy during the day, helps my hips and back and also with digestion. I tend to hunch over and slouch - not great to do after lunch - so standing keeps me and my posture in good shape. I especially like to switch to the standing desk after a meal or for a few hours after I have been sitting awhile. The newest addition to the studio is the Ergoslant Anti-Fatigue mat. It is the icing on the cake for my perfect studio set-up. I noticed when standing my legs got tired and feet felt sore if I wasn’t wearing the right shoes. I was approached by AnthroDesk to try their mat and it has been a game changer. 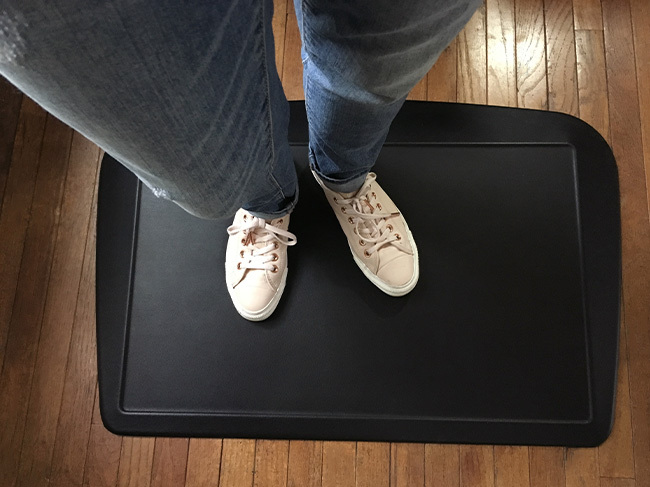 No more sore feet and legs and I can stand longer on this comfortable surface. It doesn’t matter if I wear socks or shoes either! The slant gives extra support too. I highly recommend it if you have a standing desk or looking to set up one. 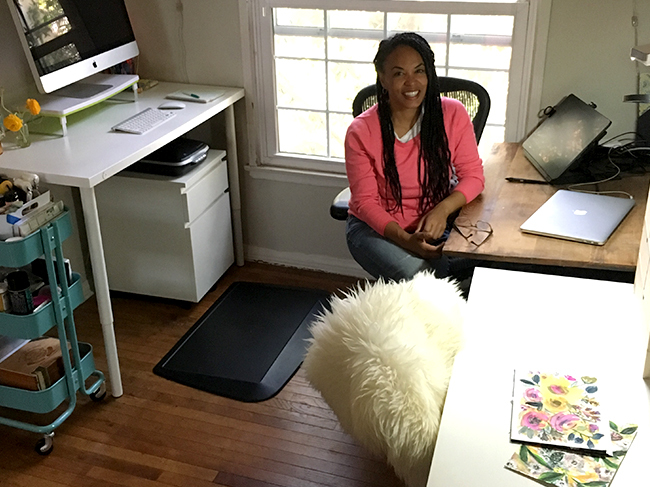 Setting up a work space is a personal and individualized process. It takes knowing your work flow, your ergonomic issues and behavior. I have definitely found out the hard way and realize that comfort is key. We spend a lot of time working. Make your space feel like home!